In the last related blog, we covered why traditional marketing is dead – ads in the phonebook, as a good example we used – and why small businesses, massive multi-million dollar conglomerates, and even sole proprietors like working artist or entrepreneurs must be using internet marketing. And there’s no doubt that if you are in any business, Internet marketing is where you should be. To start with, landing pages are one of the easiest ways to start to measure marketing effectiveness while making good ROI decisions because they are a direct response marketing method. Basically, this means that when someone enters your website, they do so on a landing page. This landing page is designed to convert a single action. It could be to set an appointment, purchase a product, or sign-up to get more information about something. While we can call any page on the web on which one might visit a “web page,” a landing page is quite different. A landing page can be defined as any page on the web on which one might land that has some kind of online conversion method, normally a form, and that also exists solely to capture a visitor’s information through that form. The most effective landing pages boast no “distractions,” and are considered optimized for conversions. Read more about what a landing page is in another recent blog. A good number of sites run by inexperienced small business owners that implement their own marketing tactics will merely push all traffic to the homepage. This includes all social media, paid ads or PPC, news, press releases and more. But this is the wrong thing to do. Home pages aren’t targeted and thus, don’t have nearly as high of a conversion rate as optimized landing pages. 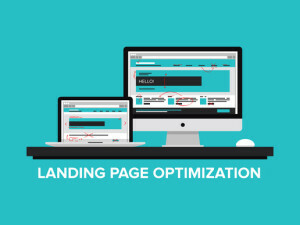 The primary goal of a landing page is to create one page per action, then segment the traffic to the appropriate landing page. All landing pages define clear conversion goals – this could encompass an appointment, phone call, a direct purchase, etc. Such a business’ site could feature a landing page about nothing more than “interior residential painting.” All copy, images and even the call-to-action would be clearly designed to convert a home owner to set an appointment, or whatever other conversion method is in place; to take this a step further, the company could have one or more landing pages per traffic source. For example, one for paid ads, another for social media, etc. And while yes, this means a higher number of landing pages, the important thing is it would result in clear numbers regarding what works and what doesn’t. In keeping with the painting contractor example, the business owner may find the company’s social channels have high conversion rates for “interior residential painting,” but horrible ones for “commercial painting;” this knowledge lets the owner put the money were the results – i.e. SALES – actually are. We believe in, and use, optimized landing pages for all online marketing – after all, the landing page is the first thing that visitors see. It’s an unfortunate fact, but the attention span of human beings in the current generation is officially shorter than your average goldfish…which clocks in at a whopping NINE seconds. With this rather frightening statistic, it’s getting more and more necessary to get a message out there as quickly as possible. Landing pages are highly effective to measure marketing effectiveness because of the direct response nature. Simple as that. What to measure here is simple. Start by selecting you time range, typically one month at a time. Take your cost of running your landing pages: your development, hosting, etc. Then take the number of conversions you have, which all landing page software, services, or landing page service providers can provide. Lastly, simply divide the cost by the number of conversion in that time period and you have your “cost per lead” for that channel. Simply repeat for the other landing pages you have and that’s it. With mere seconds to capture your audience’s attention and keep it there, we often recommend looking to elements such as video on landing pages. Video is a downright awesome component in modern marketing, and will engage your current and future clients with minimal effort while creating an emotional connection between them and your product or service. Keep in mind again that according to a study on web use conducted by Statistic Brain, the average attention span in 2012 was eight seconds, which went down from 12 seconds in 2000. A picture may be worth a thousand words…but a minute of video is worth 1.8 million words. Read about the importance of landing page video here. The bottom line is that by measuring how people use your website, you can continuously improve it, thereby improving the conversion rate…and this eventually has a positive impact on your bank balance. Previous Post: « How to Choose the Right Live Video Production Company!